Amédé Nwatchok was born in Douala, the economic capital of Cameroon. At just seven years old, he discovered the world of dance and at the age of 10 he joined Cameroon´s National Ballet. In 2004, he moved to Barcelona where he pursued his career as a dancer, dance teacher and choreographer, and also as a storyteller, actor and musician. At the same time, dance plays a key role in the social cohesion of a group; it brings people together based on a common interest and always respecting their personal level of development and awareness of their own body and their emotions. Dancer in the Cameroonian National Ballet; participated in several festivals in Africa, Europe and America. Started to teach dance and created his first choreography. 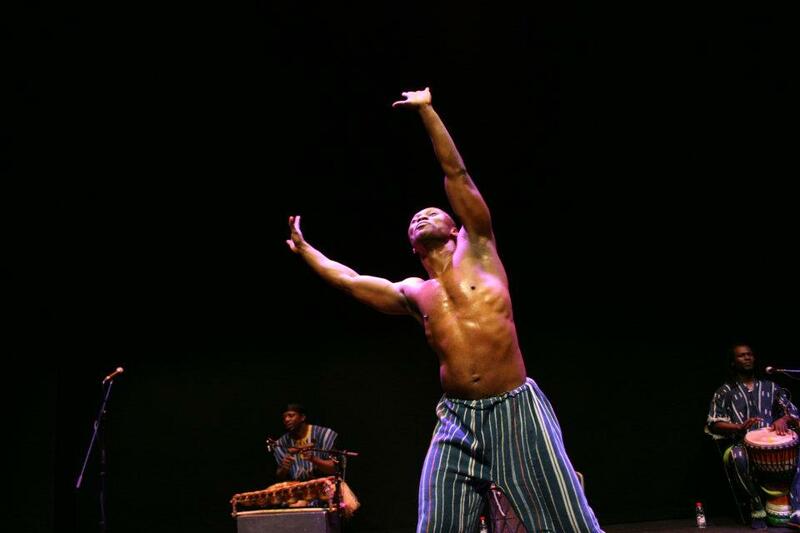 Started to research the wealth of modern African dance, and presented his second choreography in Cameroon entitled ¨Beuna Wii Afrika¨ as part of an AIDS awareness event organized by the company TotalFinaElf, where he won the first prize. Presented ¨Beuna Wii Afrika¨ at the gala evening of the Lions of Cameroon organisation at Hotel Sawa in Douala. Choregrapher in the dance company ¨Gwass du Mbam¨. Obtained several prizes in diverse festivals in Cameroon. Choreographer and dancer in the dance company ¨Piliers de Douala¨ in Cameroon. Dancer in the company Mbam Art in Bafia, Cameroon. Named best dancer at the Mbam Art and Development festival in Cameroon. Created his third work ¨Ntoop Wu Fiine¨ which won first prize at the festival ¨de la Brasserie du Cameroun¨ three years in a row. Toured Africa and Europe. Created his fourth work ¨ L’ingratitude des humains¨ and took part in festivals in Africa and in Europe. Won first prize in the festival “Guinness Cameroon”. Partipated in a contemporary dance course organized by the Centre Chorégraphique National of Nantes in Douala, Yaoundé (Cameroon), Ouagadougou (Burkina Faso) and Nantes (France). Participated in a contemporary dance course organised by the Centre Chorégraphique National of Nantes and Montpellier, France. Participated in a contemporary dance course by the dance company Kinkaleri in Italy. Moved to Barcelona. Choreographer in the dance troupe ¨Triple T¨ of Ibiza. African dance teacher in schools, colleges and universities in Spain. Created his fifth performance “ La Mémoire des Arcs¨ with his company Salamandre. Participated in the festival ¨Les Nuits Métisses¨ in Auxerre, France and in the festival of dance “Sans Frontières¨ in San Pedro, Avila, Spain. Participated with his company La Salamandre in the international folklorique festival ¨Tradicionaruis¨ in Barcelona, Spain. Participated in a not for profit festival in Seu d´Urgell, Catalonia, Spain. Partipated in the International Festival of Antioquia, Colombia. Presented his eighth contemporary dance choreography entitled ¨Femme Sacrée¨ in Hamburg, Germany. Choreographer for the “Gabalgata de reyes” (an annual Christmas traditional street procession which symbolizes the arrival of the three kings) on behalf of Barcelona´s Institute of Culture. Choreographer for the Festival of Street Music in Sant Cugat, Catalonia, Spain. Created his ninth contemporary dance work entitled “Vahe Voo Sangui” and presented it at the Festival “Africa Vive” in Bilbao, Spain and at the International Festival “Ordino” in Andorra. Choreographer for the work “Sunnù” as part of La Merce Festival organized by Barcelona´s Institute of Culture and presented at the Grec theatre and in Park Ciutadella, Barcelona, Spain. Presented his contemporary African dance work “Vahe Voo Sangui” in the municipal theatre of Banyoles, Catalonia, Spain. Presented “Femme Sacrée” at the auditorium in Cotxeres Borrell in Barcelona, Spain. Participated in the festival of national and international folk dance of Calama, Chile. Presented his tenth work “La Malédiction” in the municipal theatre of Tarragona, Spain. Presented the work “La Mémoire des Arcs” with the Cameroonian Association of Bilbao, Spain. Participated in the International Festival of Arts in Perpignan, France. Presented “Femme Sacrée” in the International Festival of Dance in Valladolid, Spain. Participated in the afro-American festival Afro-Caña of Catalonia, Spain. Participated in the festival of international culture “La Fresca” in Barcelona, Spain. Took part in the festival of international dance in Antioquia, Colombia. Moved to Marseille, France, where he teaches African dance. Presented creation “Vinem” at Le Med’s cultural centre, Marseille. Put together creation “Teranga” with children aged 4 to 12 years at the Notre-Dame de la Major school, Marseille. Took part in the festival Marsella Dakar as a dance teacher. 2015 – Participated in the international festival Les Nuits Metisses in Rennes with the group Saiko Nata. Presented new creation “Assia”with the Association Mamanthé as part of the Kadanse Caraibe festival at the Cité de la Musique, Marseille.